We all experience our own battles. As a leader of humans, here are some things to consider. Knowing about what is important to your team gives you a window into how to best support them. Stress often comes in our lives when one or more of our values are either not being honored or are challenged. This colors our workplace experience every day. And when our values are conflicting with each other, it can affect our engagement and how we show up at work and in life. I vividly remember what it felt like to go back to work as a new mom, for example. I was excited to contribute and be back doing work where I felt successful, and it felt impossible to leave my new baby with a caretaker, much less leave my thoughts of my little one at the door when I stepped into work. Occasionally, a morning routine went spectacularly wrong (I felt proud just to make it out of the house) and I had to walk into a full day of work already at the end of my rope (so help me if everyone shows up late to the conference call, I am going to lose it!). I often felt like I wasn’t fully honoring my values of career or family and therefore failing at both. It was heavy. It is important to remember that beyond the metrics or the productivity, we are all humans. And we are all experiencing our own battles. Right this moment, your coworkers may be caretaking for aging parents, watching their dog fight cancer, figuring out how to be a new parent, or managing their own anxiety. And while many of us work to leave those struggles at the door, it is impossible to separate the personal challenges from the person. Here are some things to consider as a leader of other humans. We all struggled to get here: My struggle might not look like yours. One person may have overcome external barriers, while another fought off their inner demons. Listen to seek understanding: Deep listening means listening to truly hear the answer, the story, and the feeling being described. We trip up when we listen with the intent of formulating our response or to prove the conclusion you already made. 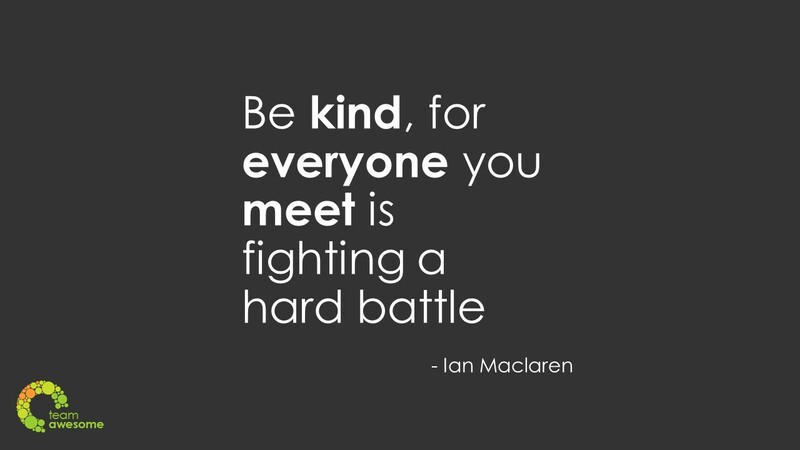 Be kind: Your team, family, or grocery store clerk does not need your struggles stacked on top of her own. Transparency and authenticity, good. Dumping negativity, less helpful. Knowing about what is important to your team and what is showing up in their life currently gives you the window into how to best support them. When sharing back with them, you are also creating the connection with them to support you when something comes up for you. After all, you are a human too.